Key players operating in the market are trying to launch new products to improve their products portfolio to widen their offering of technologically advanced eco-friendly, innovative, and high quality products. BASF SE, Eastman Chemical Company, ExxonMobil Corporation, LG Chem Ltd., Evonik Industries, Ferro Corporation, Arkema Inc., UPC Technology Corp., and Aekyung Petrochemical Co. Ltd. are some of the leading players operating in the global plasticizers market. According to the report, the global plasticizers market had a valuation of US$14.85 bn in 2015, which is expected to increase at 5.50% CAGR from 2016 to 2024. The market is expected to reach a valuation of US$23.87 bn by the end of 2024. On the basis of product, plasticizers are segmented into phthalates, non-phthalates, polymeric, and aliphates. Among these, consumes are preferring phthalates owing to their properties such as durability, better weather- and temperature-resistance, and flexibility. On the basis of application, plasticizers market is dominated by the floor walls and coverings industries owing to the steady demand for new designs of coverings especially for houses and offices. On the basis of geography, Asia Pacific presently dominates the plasticizers market and is expected to continue to dominate the market with a 6.10% CAGR from 2016 to 2024. This growth is attributed to the adoption of PVC products for decoration in houses and offices. Whereas, markets in North America and Europe are mature markets for plasticizers and are likely to have less opportunities for plasticizers manufacturers for business expansion. Plasticizers are additives mainly mixed with PVC and many other polymers. Rapid urbanization and adoption of PVC in construction industry as replacement of traditional products such as iron and wood for windows, doors, and floorings for the past few years are positively influencing growth of the market. 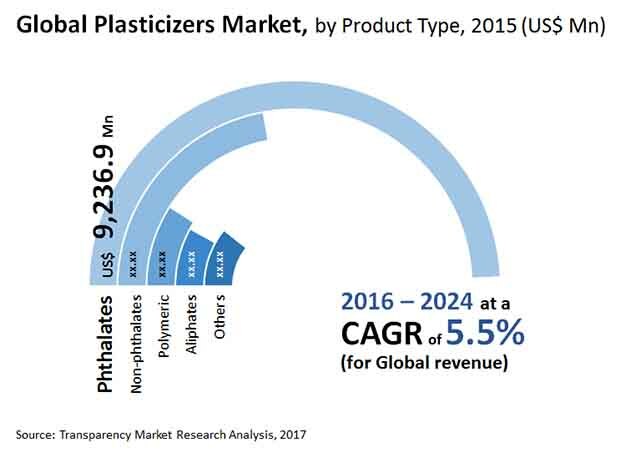 Additionally, expansion of their applications in numerous sectors including healthcare and automotive are major influencers on the growth of the plasticizers market. Especially, consumers’ preference for lightweight vehicles and need for vehicles based on the new emission standards is boosting demand for PVC-based products in the automotive industry. The trend of using plasticizers for flooring in automotive industry is expected to continue for the next few years as well, which is expected to be beneficial for the growth of the industry. However, stringent regulations imposed by government on certain plasticizers considered harmful to the health of the environment and humans for avoiding or limiting use of the plastic is the major obstacle in the growth of the plasticizers market. Also, high production cost of plasticizers is another factor expected to hamper growth of the market.